CRESPEL, EMMANUEL (baptized Jacques-Philippe), priest, Recollet, provincial commissioner of the Recollets, and author; b. 13 March 1703 at Douai, France, son of Sébastien Crespel and Louise-Thérèse Devienne; d. 29 April 1775 at Quebec. At the age of 16 Emmanuel Crespel joined the Recollets in Avesnes, France, where he made his profession on 20 Aug. 1720. Four years later he left for Quebec, arriving 8 October on the Chameau. While familiarizing himself with life in the colony, he pursued his ecclesiastical training and was ordained priest by Bishop Saint-Vallier [La Croix*] on 16 March 1726. His ministry was to be divided into two periods: one as military chaplain, the other as the administrator of his religious order. From 6 Oct. 1726 until 2 June 1728 Crespel served as priest at Fort Richelieu (Sorel, Que. ), where he left a reputation for devotion and saintliness. On 5 June 1728 he went as chaplain with a force being sent under Constant Le Marchand* de Lignery to fight the Foxes in the Great Lakes region. In face of an enemy who kept slipping away, the contingent had to be satisfied with burning villages and destroying crops. After this exploit, which Father Crespel considered “absolutely useless,” the expedition returned to Montreal at the end of September. The following summer he went back to the Great Lakes region to serve as chaplain, first at Fort Niagara (near Youngstown, N.Y.) from 27 July 1729 until 1732, then at Fort Frontenac (Kingston, Ont.) until 1735, and finally at Fort Saint-Frédéric (near Crown Point, N.Y.) from 17 Nov. 1735 until 21 Sept. 1736. His superiors having recalled him to France, Crespel sailed on the Renommée, a new ship under the command of Joseph Damours de Freneuse, who had 46 years of experience at sea. The ship left Quebec on 3 Nov. 1736 with 54 passengers but 11 days later ran aground on the southern tip of Anticosti Island. Seeing that there was no possibility of help before spring, the group decided to break up: 24 men remained at the scene of the shipwreck, the others attempted to get to the Mingan Islands where some Frenchmen were spending the winter. On 27 November, 13 men climbed into the dinghy while 17 others, including Father Crespel and Captain Damours, crowded into the longboat. The latter soon lost sight of the dinghy, which evidently was dashed to pieces, since debris from it was found the following spring. Father Crespel and his companions succeeded in rounding the western tip of Anticosti Island. The weather, however, was steadily becoming colder, and on 7 December, unable to go farther because of ice, they had to take shelter in a bay on the north shore of the island. Bad weather, famine, fever, and other illnesses killed nearly all the Recollet’s companions. At the end of April, the three survivors obtained help from some Indians. On 1 May Crespel succeeded in reaching the post of Mingan, which at that time was under the command of Jean-Louis Volant d’Haudebourg. With d’Haudebourg accompanying him, Crespel returned to the scene of the shipwreck, and found four men still alive; one of them died soon after. Crespel has left us an account of this shipwreck written in the form of letters to his brother. Although his narrative cannot be described as a masterpiece, it has a quality of sincerity that is moving. As a simple adventure story, and for this very reason, the book met with astonishing success from the moment of its publication in 1742 and went through many subsequent reprintings as well as translation into German and English. Father Crespel returned to Quebec on 13 June 1737. One can imagine the amazement that greeted him, since he was believed to be in France. After a few weeks spent regaining his strength, he was appointed to be parish priest at Soulanges (Que. ), a post he held for a year. Having been recalled to France again, he sailed on 21 Oct. 1738 on the king’s vessel Rubis, which reached Port-Louis in Brittany on 2 December; he arrived in Paris at the year’s end. Early in 1740 he was named vicar of the monastery in Avesnes. The quiet weighed upon him, however; returning to Paris, he resumed his duties as a military chaplain and for eight years served in the force under the Maréchal de Maillebois which took part in the campaign against Austria. Incidentally, it was at Maillebois’s residence at Paderborn (Federal Republic of Germany) that he wrote the account of his voyage. Having returned to Canada – in 1750, it seems – he became the provincial commissioner of the Recollets, an office he retained for the rest of his life except for the period 1753–56, when he served as superior of the monastery in Quebec. He was in charge of his order at a difficult time, when the British authorities prevented the recruitment of new members. 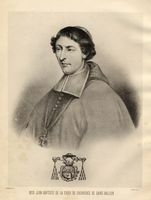 In 1762 Colonel Frederick Haldimand was indignant that Father Crespel changed the superiors in Montreal and Trois-Rivières without having asked his permission. Although Crespel remained inflexible on this matter, he nevertheless finally won the respect of the new rulers. Emmanuel Crespel died on 29 April 1775 and was buried in the Recollet church on 1 May. When the church was destroyed by a fire, his remains were transferred to the cathedral of Notre-Dame in Quebec. It was his book that in the end made him famous. In addition to the story of his shipwreck, Father Crespel included one letter recounting the expedition against the Fox tribe, and another describing his years at Niagara, Detroit, and Saint-Frédéric, the country he had traversed, and the Indians’ customs. Crespel had a real gift as a storyteller that won him the public’s favour. Father Emmanuel Crespel is the author of Voiages du R. P. Emmanuel Crespel, dans le Canada et son naufrage en revenant en France, Louis Crespel, édit. (Francfort-sur-le-Main, 1742). The work was well received and was first republished at Amsterdam in 1757 with the title Voyage au Nouveau-Monde et histoire intéressante du naufrage du R. P. Crespel, avec des notes historiques et géographiques. Subsequent reprints include those issued in 1808 and 1884 at Quebec and in 1968 at Montreal. The work was translated into German as Des Ehrwürdigen Pater Emanuel Crespels merkwürdige Reisen nach Canada . . . aus dem Französischen übersezt (Frankfurt am Main and Leipzig, 1751) and into English as Travels in North America, by M. Crespel . . . (London, 1797). The account was also published in serial form in various magazines, including the Magazin du Bas-Canada (Montréal), I (janv.-juin 1832), 122–28, 162–70, 204–13, under the title “Relation du naufrage du navire la Renommée, sur les côtes de l’isle d’Anticosti; extraite d’une série de lettres du P. Emmanuel Crespel, récollet, à son frère”; and Mélanges religieux (Montréal), 14, 16, 21, 28 mars, 1er, 4, 8 avril 1851, under the title “Voyages au Canada et naufrage du R.P. Emmanuel Crespel, récollet, sur l’isle d’Anticosti, en 1736.” The English version may also be found as “Voyages of Rev. Father Emmanuel Crespel, in Canada, and his shipwreck, while returning to France” in Perils of the ocean and wilderness . . . , ed J. [D.] G. Shea (Boston, Mass., ), 131–206. An analysis of Crespel’s work, signed “Actidès,” has been published in L’Abeille (Québec), 27 mars 1850, 1–2; 4 avril 1850, 1–2. A portrait of Crespel, believed to have been executed around 1758 by another Recollet, Brother François, is held by the Musée du Québec. AAQ, 12 A, C, 32, 34; 66 CD, I, 25, 29. ACAM, 901.001, 761–1. Archives municipales, Douai (dép. du Nord, France), État civil, Saint-Pierre, 13 mars 1703. ASQ, Fonds Viger-Verreau, Sér.O, 081, p.10; Lettres, M, 142, 143; S, 4, 4Bis; mss, 146, 191b; Polygraphie, XXV, 4e; XXXI, 40. PAC, MG 18, E15. PAC Rapport, 1886, 520. Quebec Gazette, 4, 25 May 1775. Allaire, Dictionnaire, I, 138–39. Biographie universelle (Michaud et Desplaces), IX, 481. DOLQ, I, 183, 214, 788–89. Jouve, Les franciscains et le Canada: aux Trois-Rivières, 190, 203. J. H. Kennedy, Jesuit and savage in New France (New Haven, Conn., and London, 1950), 178. M. Trudel, Le Régime militaire, 138–39. Archange Godbout, “Les aumôniers de la vallée du Richelieu,” SCHÉC Rapport, 13 (1945–46), 69–71. O.-M. Jouve, “Les anciens récollets, le R. P. Emmanuel Crespel,” Revue du Tiers-Ordre et de la Terre-Sainte (Montréal), 1905, 1906, 1907. Hugolin Lemay, “Le P. Emmanuel Crespel, commissaire des récollets au Canada,” BRH, XLIV (1938), 169–71. P.-G. Roy, “Le capitaine de Freneuse et le naufrage de la Renommée,” BRH, XXII (1916), 60–61. Jean-Guy Pelletier, “CRESPEL, EMMANUEL,” in Dictionary of Canadian Biography, vol. 4, University of Toronto/Université Laval, 2003–, accessed April 24, 2019, http://www.biographi.ca/en/bio/crespel_emmanuel_4E.html.